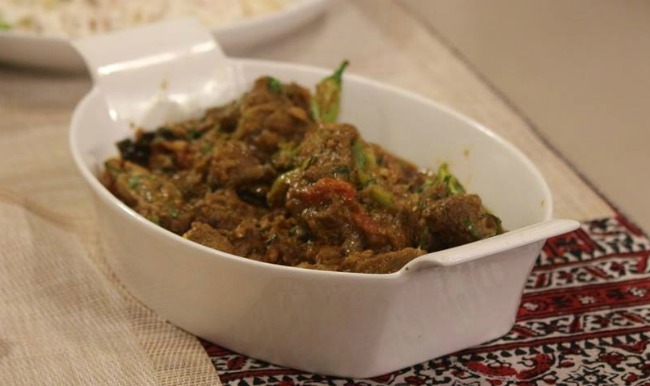 Dehli ka Tawa Mutton is a lip smacking recipe and perfect to serve at special event. Serve it with raita and hot paratha. The dishes make on Tawa has a distinct taste. Must try these recipes for a satisfying taste tawa chicken and tawa qeema. Add mutton, water, bay leaf, black cardamom, green cardamom, cinnamon, onion, ginger garlic, coriander powder, cumin powder, garam masala, salt, red chili, turmeric and ¼ cup oil in coking pan and cook till mutton tender and oil separates. Then add in yogurt and fry well. Keep aside. Heat remaining oil on tawa (griddle) sauté onion till brown. Add ginger garlic and tomatoes. Fry well. Add red chili powder, garam masala powder, cumin, and shift cooked mutton on tawa. Fry for 10 minutes. Lastly add green chili, garam masala, lemon juice and coriander leaves.